The Third Doctor burst onto our screens in full techno-colour glory in January 1970 – in the season 7 opener; Spearhead from Space. This Doctor was very different from his two previous incarnations. He was dapper, well turned out, dashing and extremely sure of himself – in a silverscreen Cary Grant – movie star kind of way! He knew Venusian karate and he wasn’t afraid to get in a ruckus. He had the first sonic screwdriver to help him out of jams (this bit of kit would become synonymous with Who from here on in). He also had a classic yellow car called – “Bessie”, a flying mino-hovercraft called ‘Who-1’, aswell as the grounded Tardis. Pertwee had previously starred in the Carry-On-Series and had a long running role on the BBC Radio comedy drama The Navy Lark and had tread the boards a number of times in between. For the first three seasons, the Doctor was Earthbound – (having just been punished by the Timelord’s in Troughton’s The War Games – 1969) – and many of his adventures were about adjusting to his new existence, without a working Tardis (deactivated by the Timelord’s). It wasn’t until The Three Doctors – 1973 that he regained the ability to time travel (by choice). The reason for ‘grounding’ the Doctor was intended budgetry cut reasons, but the programme ended up spending as much, if not more as ratings soared and interest in the programme increased. The third Doctor spent most of his time with UNIT, (United Nations Intelligence Taskforce) – working under the command of the Brigadier as “Special advisor”. This was a show with a regular strong cast including – Brigadier Lethbridge-Stewart, Sergeant Benton and Captain Yates; and although the Doctor was stuck on his favourite planet, it didn’t dampen the scope or imagination of the stories. Barely functioning after his regeneration – which resulted in a trip to hospital, we find in Spearhead from Space – that the Doctor had 2 hearts. The Doctor then acquired his first companion during these times; Liz Shaw – a fellow UNIT scientific adviser. His first outing had him battling the sinisterly effective shop dummy’s – the Auton’s and grotesque Nestene. He then went underground – (quite literally!) in Doctor Who & The Silurians – 1970 to meet the true original rulers of the earth. Who also went all Star Trek parallel universe; meeting the evil version of the Brigadier (bespoke with eyepatch!) in Inferno – 1970 which gave more than a nod to the classic TOS episode Mirror Mirror. This Doctor, unlike previous incarnations (and future versions!) was not afraid to pick a fight. This was a refreshing change from previously attempting to disarm with wit – or talk his way out of every situation. He would frequently resort to Venusian karate chops to the neck, to incapacitate his aggressors. This gave Pertwee’s Doctor an exciting action edge over his predecessors. Pertwee’s Doctor was no slouch in the brain department either and it was fun watching Pertwee chew scenery, as he belittled the succession of stuffy government ministers and professors; who attempted to beat him in a battle of wits. The third Doctor was also joined by arguably two of the greatest companions in Who history – Jo Grant – (Terror of the Autons – 1971) and later Sarah Jane Smith – (introduced in The Time Warrior – 1973). In an age of early feminism, these were as much a step up in terms of juicy female characterization as the times would allow. Another element which added to the mix was the introduction of the character “The Master” in Terror of the Autons – 1971. The Moriarty style antypothesis of the Doctor – brilliantly played by Pertwee’s friend; Roger Delgado. The Master was the next step up from the Time Meddler, in that he was a fellow Timelord and in every way the Doctor’s intellectual equal and a dangerous opponent. He had a working Tardis with a functioning Chameleon circut (It could change shape – unlike the Doctor’s). The Master came to be quite the thorn in the Doctor’s side, appearing in every episode of season 8. The Daleks made notable reappearances in Day of the Daleks – 1972 and Planet of the Daleks – 1973. Day of the Daleks was to reintroduce the familiar Dalek infiltration and control of a future earth society. It also included an interesting subplot of a group of freedom fighters being locked in a ‘temporal causal time paradox’, by going back in time and assassinating somebody they believed would change the future – but they were infact, perpetuating the future they were trying to change. The Doctor worked out that this was the problem went back in time and stopped the loop from continuing. This idea of a time paradox would become prevalent as a concept in the new series of Doctor Who; especially the Timelocked Time war between the Timelords and Daleks. The Cybermen were strangely missing from Pertwee’s tenure (bar a brief cameo in Carnival of Monsters – 1973) but with so many other new villians created, during the era – including the Sontaran’s (The Time Warrior – 1973), The Master, Silurians and Sea Devils – it wasn’t like they were desperately missed. 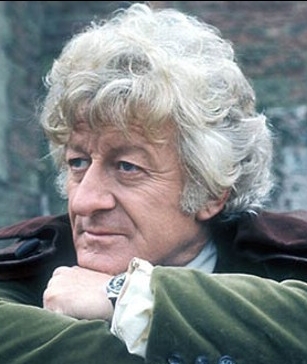 The standout serial of the Third Doctor’s reign was The Three Doctors – 1973. Featuring the return of William Hartnell and Patrick Troughton. All three had great chemistry and each of their scenes together were a joy, as they bickered and squabbled. 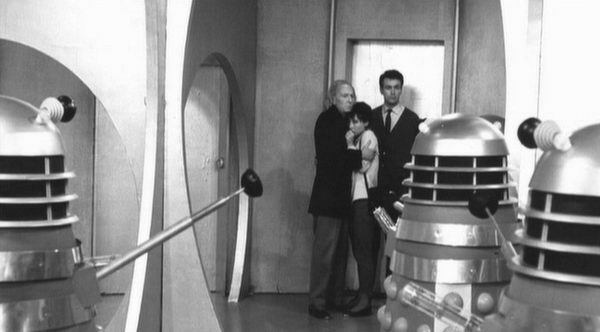 Due to his deteriorating health, Hartnell’s role was cut back to a small cameo, coming in to set the other two Doctor’s straight when their arguments were getting out of hand or they were stuck. Hartnell died – a couple of years later. This serial is also notable as the Doctor finally won back his right to time travel, again – by helping out the Time Lords. His reward was a new ‘time de-materialisation circuit’. The Doctor went all ‘green’, literally – in The Green Death – 1973 , fighting off the disgusting green giant maggots – caused by human pollution, which was a deliberate nod to early environmental concerns. The Doctor’s final serial – Planet of the Spiders – 1974, had the Doctor’s past catching up with him. As a rare blue crystal he had “borrowed” from Metabelis 3, was liberated and returned to the indiginous race of giant spiders. The spiders were using the crystal, to become all powerful. During his skirmish with the “8 legs”, he sustained a lethal dose of radiation and upon returning to earth, collapsed on the floor at Unit and promptly regenerated. Interestingly though, this is the first time in Who history the term “regeneration” is used. The thing that instantly sticks about Pertwee’s time overall, is the change in tone of the show. Out went the slow dramatic tension and deliberate buildup and in came action, fun and chase sequences. This was personified by Pertwee himself, who played the most action orientated Doctor to date. all in all, a golden era in the history of the programme.